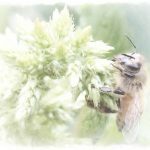 I have not posted in awhile however there is a topic looming over me and on the mind of many beekeepers. Plants and insects have been evolving in unison for millions of years and have benefited from an elegant symbiotic relationship. This relationship has provided plants a willing host to convey pollen in trade for valuable high energy cocktail called nectar. Residual pollen is an added bonus protein source. A new dynamic is disrupting the alignment of this interaction. Climate change is affecting this coordinated inter species relationship by disrupting the flower blooming cycle. Plants have evolved a response to the spring warming cycle that starts the flowering process in most of the northern hemisphere. With the earlier spring and wondering arctic weather poll with a deep cold we call an arctic blast we are witness to the impact of plants and pollinators. Plants that start their spring cycle early may fall victim to a polar blast that will kill off new growth including blossoms. Pollinators in turn will suffer in that a vital food source will be removed. In its simplest description plants will have little or no reproductive ability and pollinators will be faced with a dwindling energy source. Insects and plants cannot adapt to this rapidly changing environment as they are locked into a unique interwoven relationship with every facet of the world around them. There will be a decline in pollination that in turn will reflect in the reproductive rate of plants echoing through the food chain to other species. This reproductive impact is of utmost concern as it essentially hampers the world’s major carbon sink i.e. plants! As a beekeeper I witness this first hand suffering population loss from the wide temperature swings along with dwindling honey production. The bees feel the warm weather become active consuming honey for energy and the queen naturally starts laying eggs as workers are needed to for their age old cycle. If and when the extreme cold returns the bees eat more of their honey reserves to keep themselves and brood warm. If the brood dies it creates other problems in the hive that further impact their winter survival rate beyond starvation. The summers are longer and dryer and again the bees dip into their reserves to bridge the gap to the fall flowering season. The fall season is dependent on summer rains to provide necessary moisture for nectar to flow. A drier season plants sacrifice nectar volume for their own survival. Lower fall honey volume in turn impacts the honeybee’s survival rate. Mix in the list of other difficulties from parasites to pesticides and the outlook is grim. I am perplexed and dismayed by human politics and its evil twin greed. Climate change is at this point self evident. The answer is very simplistic as any Zen master will tell you. There are 2 choices we can do something and be wrong or do nothing and be wrong.